Location of Thompsonville in Franklin County, Illinois. Thompsonville is a village in Franklin County, Illinois, United States. The population was 543 at the 2010 census. There was an early settlement started in the general vicinity called "Jordan's Settlement". It was founded in 1811. Thompsonville is located in southeastern Franklin County at 37°54′59″N 88°45′42″W﻿ / ﻿37.91639°N 88.76167°W﻿ / 37.91639; -88.76167 (37.916443, -88.761564). Illinois Route 34 passes through the village, leading northwest 10 miles (16 km) to Benton, the county seat, and southeast 21 miles (34 km) to Harrisburg. Illinois Route 149 leads west from Thompsonville 9 miles (14 km) to West Frankfort. In the village, the population was spread out with 23.5% under the age of 18, 9.8% from 18 to 24, 31.0% from 25 to 44, 20.5% from 45 to 64, and 15.2% who were 65 years of age or older. The median age was 38 years. For every 100 females, there were 95.5 males. For every 100 females age 18 and over, there were 94.2 males. The median income for a household in the village was $30,500, and the median income for a family was $33,750. Males had a median income of $25,563 versus $17,656 for females. The per capita income for the village was $13,327. About 14.0% of families and 17.8% of the population were below the poverty line, including 25.2% of those under age 18 and 12.3% of those age 65 or over. 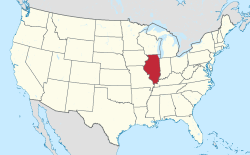 ^ "Geographic Identifiers: 2010 Census Summary File 1 (G001), Thompsonville village, Illinois". American FactFinder. U.S. Census Bureau. Retrieved May 4, 2016. This page was last edited on 6 May 2018, at 23:16 (UTC).